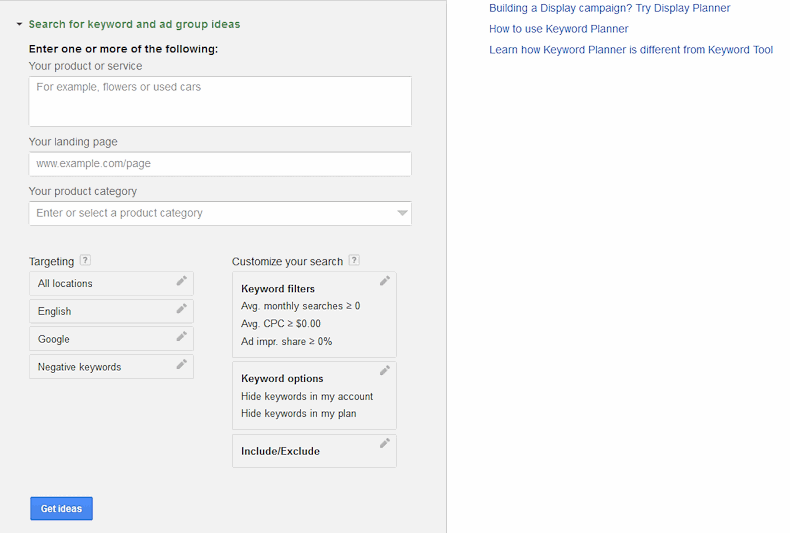 Google has replaced the good old Keyword Tool with its new Keyword Planner, which is supposed to offer the functions provided by the old Keyword Tool and the Traffic Estimator tool. The change has left lots of people confused; that is why I have decided to write this Google Keyword Planner tutorial in the first place. To begin with, you will need a Google AdWords account; you can’t get access to the data without logging into your account. It’s easy to create an account, though, and this is that first thing you are going to see when you log into the account and select the Keyword Planner tool. So what would you like to do? 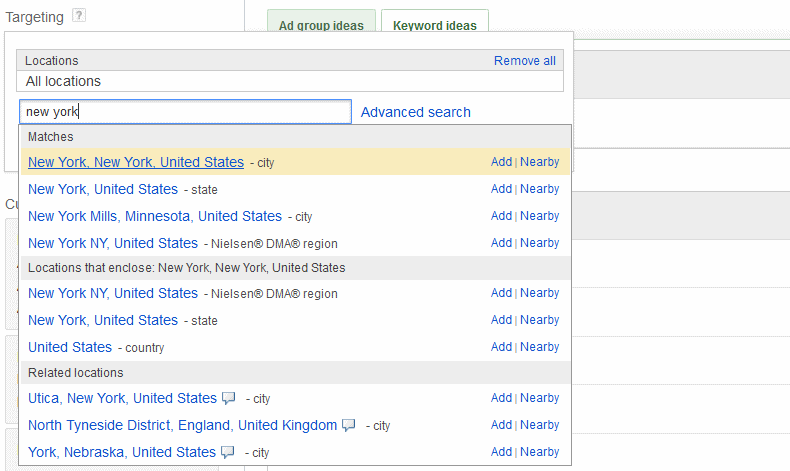 The first option allows you to search for keywords and ad group ideas. Type in the keyword that interests you in the “Your product or service” field. If you want to work with several keywords at once, place each keyword on a new line or use a comma to separate them. “Your landing page” can be automatically reviewed by Google; you will get a list of suggestions based on the content of your landing page. I don’t recommend using this option blindly, but it could bring in some good keywords that you’ve never thought about. Are you interested in getting new, unusual keyword ideas? Then “Your product category” is just what you may need; Google will use this field to search for industry-related keywords that you might have missed. The “Targeting” section allows you to target a specific location or a specific language and gives you the option to display the ads on Google’s website alone or on its partners’ website as well. Finally, you can input a list of negative keywords; this way, your ads will not be displayed when the people are typing one of the keywords on your list. As an example, if you are selling a video marketing book, you may want to add “free” to your negative keywords list; this way, your ads will not be displayed (you won’t lose money) when somebody types in “free video marketing book” into Google’s search box. It’s time to discuss the “Customize your search” section of the tool. “Keyword filters” allow you to target keywords that have certain search volume limits. Many PPC bidders make the mistake of only targeting keywords that have over (let’s say) 1000 searches per month, when they should also go for highly targeted, low volume keywords. You can also specify the average CPC values here. Most people will want to make sure that their CPC costs don’t exceed a certain value, but you have the option of targeting the most expensive keywords as well. Why would you want to do that? I’m not sure, maybe your boss is giving you a hard time and you want to drain his bank account as quickly as possible! 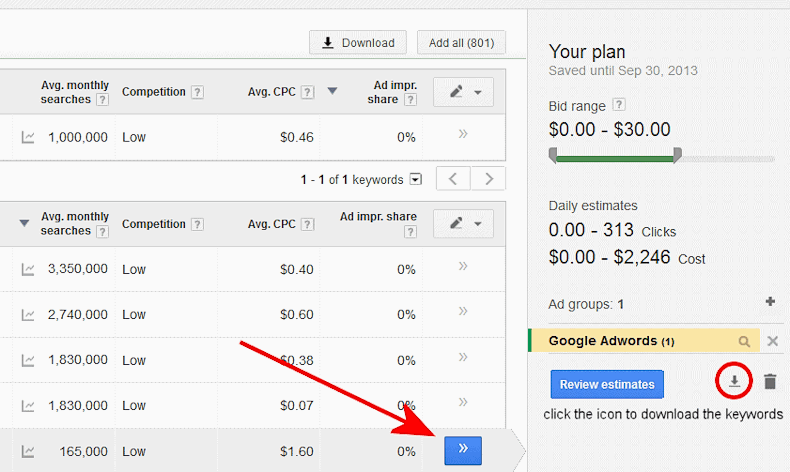 “Ad impression share” allows you to specify an ad display threshold that is based on the number of impressions. “Keyword Options” allows you to enable / disable adult keywords and keywords that are already used with your AdWords account. Finally, “Include / Exclude” gives you the option to include or exclude a list of keywords from your account. I have typed “google adwords” in the “Your product or service” text box (leaving all the other options to their default values) for my example. As you will see, the keyword research result defaults to “Ad group ideas”, which groups the keywords on categories, also known as “Ad groups”. As an example, if you click the “Coupons” Ad group, you will get a list with coupon-related keywords that can be plugged straight into your pay per click campaign. Google will show ranges (rather than exact search volumes) for “Avg. 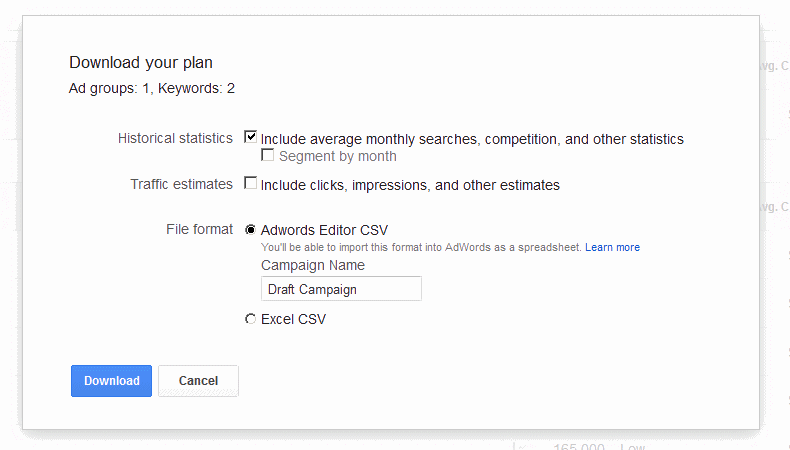 monthly searches”, if you don’t have an active AdWords campaign. It is quite clear that the Ad groups were designed for PPC campaigns, but they are good for the SEO people as well. By taking a good look at an Ad group, you can easily determine which keywords are seen as being topically related from Google’s point of view. This will allow you to easily get several great ideas for a set of blog posts that target a specific topic, for example. Of course, the people that are interested in using the Keyword Planner tool for search engine optimization or advanced PPC campaigns will want to take a closer look at the “Keyword ideas” tab as well. If you used Google’s Keyword Tool in the past, you will notice something that’s quite disturbing: the “Global Monthly Searches” and “Local Monthly Searches” are gone for good, being replaced with “Avg. monthly searches”. Google has stated that, in general, the Avg. 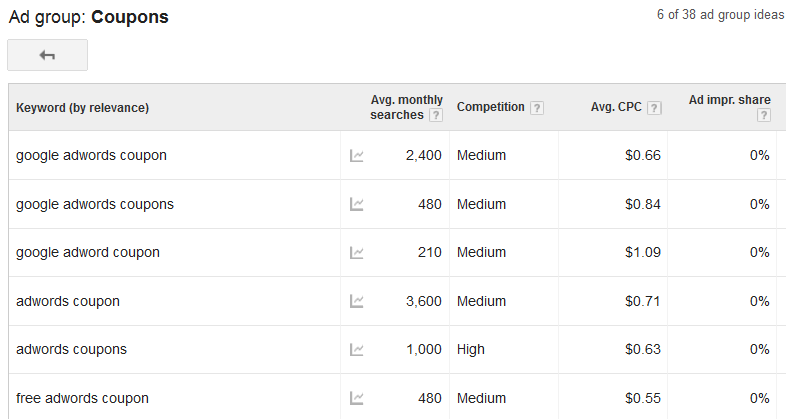 monthly searches values are bigger than the ones offered by the former Keyword Tool. The explanation for this is simple: the new tool shows the search volume for all the devices, no matter if we are talking about cell phones, laptops, regular computers, and so on. Is this a good thing? The tablets are here to stay for good, but if you are (for example) using AdWords to collect leads, making people fill-in a long submission form, you don’t want to waste your money paying for visitors that use their cell phones to arrive at your site – very few of them will take the time to type in large amounts of data using the tiny virtual smartphone keyboard. And even if your site is mobile-responsive, the conversion rate will be much lower in comparison with the visits coming from tablet, desktop and laptop computers. One more thing: Google Trends should continue to be your main source of information for seasonal industries; the Keyword Planner will only give you “Avg. monthly searches” for the last 12 months. If you sell Christmas products, you’d better use Google Trends to gather some insight. It’s not all bad news, though; many people (including myself) love the option of getting access to the highly targeted, local search volume values. If you run a local business or you are targeting specific areas with your marketing campaigns, the new tool will offer you valuable information. You will be able to drill down and extract search volumes even for small cities, thus being able to focus your energy on areas where your products or services are in high demand. Of course, if you sell high ticket items, you could also use the Keyword Planner to pick small towns where the SEO and AdWords competition is virtually inexistent, and thus maximize your chances of dominating those markets. The old Keyword Tool offered broad, exact and phrase match search volumes, but the new Keyword Planner only offers us exact match values. I’d say that this change isn’t that bad; most SEOs and PPC bidders were using exact match anyway, because using broad match keywords for AdWords campaigns has the potential to quickly drain anyone’s bank account. Warning! Many people believe that the broad, exact and phrase match values can easily be chosen from the pen icon on the right side of the Keyword Planner tool. Make no mistake, these options will only set the way (broad, exact, phrase match) in which your keywords will be added to the AdWords Campaign, in case that you want to do that from within the Keyword Planner tool. The old broad, exact and phrase match search volume values are gone for good. You can download the entire 800 words keyword list, of course, but if you are only interested in PPC, you should only add the winners to your campaign. Just move the mouse over the >> symbols at the right side of the screen, and then click the blue box to have that particular keyword added to your campaign. You can also save the winners to a file, so that you can study them later. Click the download icon (the small arrow pointing downwards in the picture above) to bring in the “Download your plan” window. You will have the option of segmenting the data on a monthly basis; keep in mind that we’re only getting access to the data from the last 12 months, so this is a no go for people working in seasonal industries. 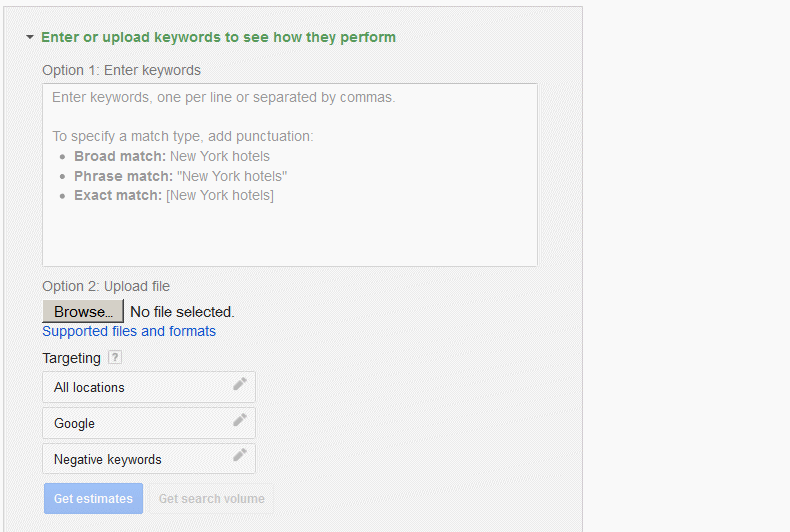 The second option of the Keyword Planner tool allows you to upload your own keywords. This is the perfect opportunity for the people that have found lots of proven, money making keywords throughout the years. If you don’t have too many keywords you can simply type them in; you will see how to input broad, exact and phrase match keywords in the window that opens up. Of course, if you have lots of keywords, it makes a lot of sense to load a csv (comma-separated values) file that contains your keywords, rather than typing them in one by one. 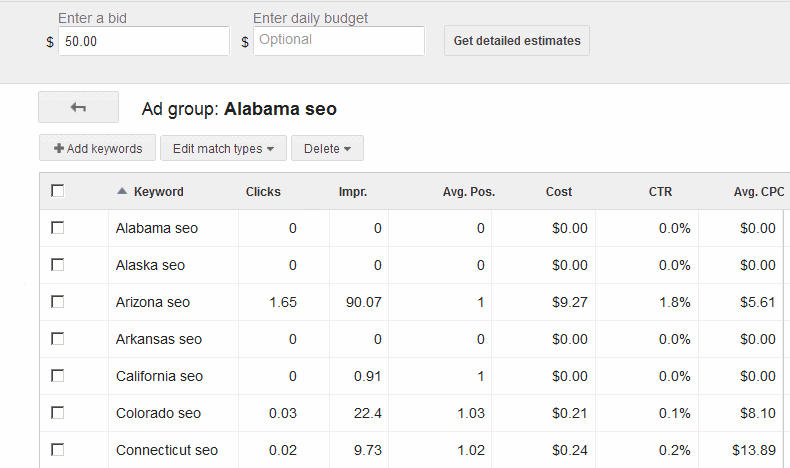 Click the “Get estimates” button to analyze your own keywords, rather that examining the ones that are generated by Google’s tool. You will have the option of evaluating how many clicks or impressions your ads can get per day, as well as figure out a daily CPC budget. The people interested in SEO will be able to find out what is the average click through rate for a particular set of keywords, as well as determine how much demand there is for their products in a particular area (all the “Targeting” options are available). This is a tiny little tool that may save you a lot of time, allowing you to combine up to 3 lists (click the 2nd big X to display the 3rd list field). You will want to copy / paste the names of the American states in the first list box and your industry in the second box, for example. Then, set your bid value and click the “Get detailed estimates” button. Make sure to double check all the keywords that were generated using this tool; you will discover that some of them aren’t useful at all. Still, it’s a quick way of determining if your products are searched for in a particular state, city, etc. 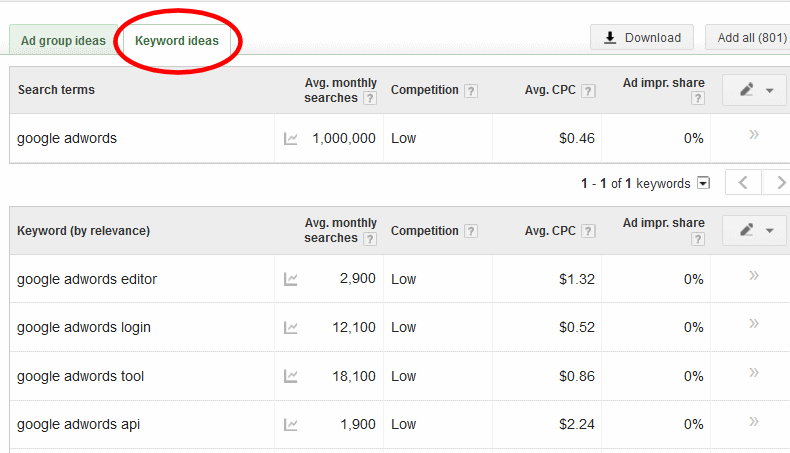 So is the new Keyword Planner better than the old Keyword Tool? It’s not an easy to answer question. If you use Google AdWords for your PPC marketing campaigns, I am pretty sure that you are going to love some of the new features. On the other hand, the increased search volume values will please Google’s shareholders for sure, but they won’t make the AdWords bidders jump with excitement; a part of their website traffic will come from cell phone users, who don’t use their phones to buy stuff from the internet in large numbers – at least not yet. The phrase and broad match values aren’t available in the new tool. The global and local monthly search volumes are gone as well. It’s not something that we couldn’t live without, but it was nice to have access to that information. I like the much better “Targeting” options of the tool, though. And the new keyword upload option will work fine for up to 10,000 keywords, which is more than enough for most people’s needs. One thing is for sure: no matter if we’re doing PPC or SEO, we will have to use the data offered by Google’s Keyword Planner from now on, so it’s time to get used to it. And I really hope that this tutorial has given you enough info to get started.